•Aggressive and unique styling, these big, beefy bars take the cake. •High quality, steel tubing with a beautiful CHROME finish. •The huge 1-1/2" diameter tube tapers down to 1" to mate to your stock controls and runs a 1" clamp area. 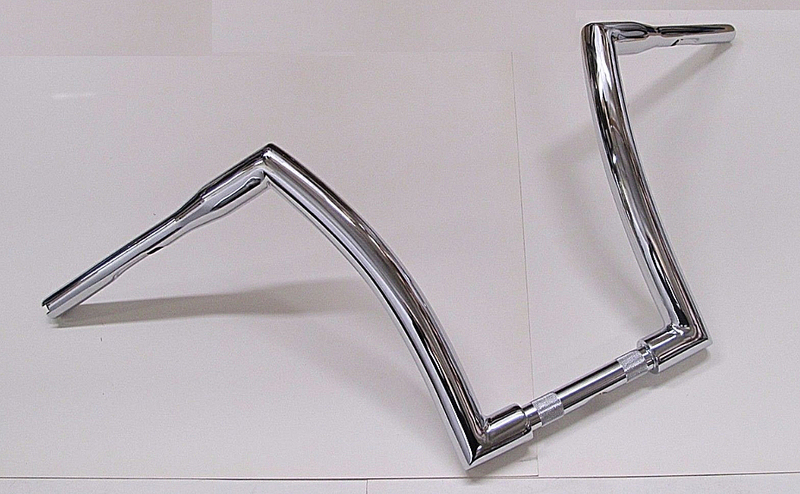 •Regarding throttle-by-wire: These handlebars have notched ends for throttle-by-wire, but require modification - the dimple for stock wiring gets in the way of the throttle-by-wire's throttle assembly sliding all the way inside the tip of the bar. This dimple would need to be bored out. If you have access to a machine shop / good garage, modification can be made. Not for Street Glide or any Touring model with batwing fairing. Center Width total 1" portion: 5-1/2"
Width (at bottom, outside): 11"
Width (at bottom, inside width between risers): 8"